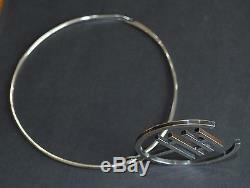 Ladies sterling silver choker necklace with abstract pendant. Vintage piece circa mid 1970. 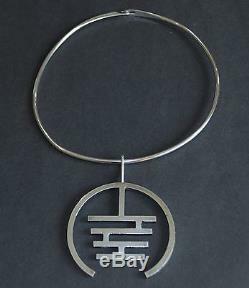 Item is 925S sterling silver from Denmark by designer Arne Johansen. The wire is 2.5mm round and is choker length. It would fit a smaller size neck of about 14. 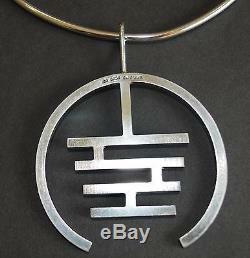 The pendant measures 58mm across (2 1/4) and is 2.7mm thick. Wire and pendant are solid, not hollow. 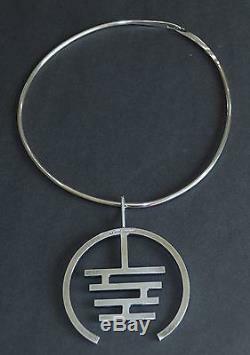 Johansen was a silversmith and jewelry designer from 1954 to 1976 from Denmark. The item "Vintage Modernist Arne Johansen Denmark 925S Sterling Silver Necklace Choker" is in sale since Thursday, July 20, 2017. This item is in the category "Jewelry & Watches\Vintage & Antique Jewelry\Vintage Ethnic/Regional/Tribal\Scandinavian". The seller is "ptau1" and is located in Cottonwood, Arizona. This item can be shipped to United States, Canada, United Kingdom, Denmark, Romania, Slovakia, Bulgaria, Czech republic, Finland, Hungary, Latvia, Lithuania, Malta, Estonia, Australia, Greece, Portugal, Cyprus, Slovenia, Japan, China, Sweden, South Korea, Indonesia, Taiwan, South africa, Thailand, Belgium, France, Hong Kong, Ireland, Netherlands, Poland, Spain, Italy, Germany, Austria, Russian federation, Israel, Mexico, New Zealand, Philippines, Singapore, Norway, Saudi arabia, United arab emirates, Qatar, Kuwait, Bahrain, Croatia, Malaysia, Brazil, Chile, Colombia, Costa rica.